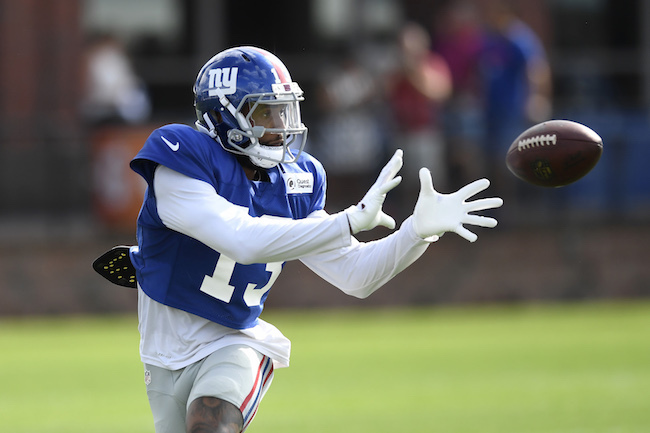 The New York Giants held their eighth full-team summer training camp practice on Friday at Quest Diagnostics Training Center in East Rutherford, New Jersey. The complete training camp schedule is available at Giants.com. The New York Giants have signed cornerback Leonard Johnson. The 28-year old, 5’10”, 194-pound Johnson was originally signed as an undrafted rookie free agent by the Tampa Bay Buccaneers after the 2012 NFL Draft. He has spent time with the Buccaneers (2012-2015), New England Patriots (2015), Carolina Panthers (2016), and Buffalo Bills (2017). In six NFL seasons, Johnson has played in 77 regular-season games with 27 starts, including seven starts with the Bills in 2017, when he was the team’s slot corner. Johnson has five career interceptions, but the last came in 2014. To make room for Johnson, the Giants waived cornerback Kenneth Durden again. The Giants signed Durden in June 2018, cut him, and re-signed him in July 2018. The 6’1”, 180-pound Durden was originally signed as an undrafted rookie free agent by the Oakland Raiders after the 2016 NFL Draft. He spent his rookie season on the Raiders’ Practice Squad before being cut in September 2017. The Tennessee Titans then signed him to their Practice Squad and cut him in October 2017. Not practicing on Friday were safety Curtis Riley (hamstring), cornerback Donte Deayon (hamstring), linebacker Thurston Armbrister (hamstring), and defensive lineman R.J. McIntosh (unknown – Active/Non-Football Illness list). Cornerback William Gay (hamstring?) left practice early with his thigh wrapped. Cornerback Teddy Williams was excused from practice due to personal reasons. #Giants CB Sam Beal, their supplemental draft whose season recently ended before it befan following a dislocated shoulder, will have surgery today to repair it, source said. Plenty of time to be ready for 2019. Giants were in helmets and shells today with no tackling. Tight end Evan Engram appeared to beat cornerback William Gay deep down the field, but Gay was able to recover and knock the pass away. John Jerry was back at second-team right guard with Victor Salako now the third-team right tackle. For the second day in a row, cornerback C.W. Webb, who has been taking some first-team snaps at slot corner, picked off quarterback Davis Webb. Later, Webb was picked off again, this time by linebacker Ray-Ray Armstrong. Brett Jones practiced with the first team at center and John Greco with the second team at center. Jon Halapio was back as the first-team center by the end of practice. Safety Orion Stewart picked off quarterback Alex Tanney near the goal line on a deep pass intended for wide receiver Alonzo Russell. Cornerback William Gay, who has been playing nickel corner and some safety, did a nice job of covering tight end Evan Engram in the end zone. Cornerback Eli Apple broke up a deep pass from quarterback Eli Manning intended for wideout Sterling Shepard. Giants continue to split running back Saquon Barkley out wide as a receiving target with good success. He beat cornerback Janoris Jenkins for a touchdown on a slant route. Wide receiver Odell Beckham, Jr. made a diving catch in the corner of the end zone for a touchdown on a pass from a scrambling quarterback Eli Manning. Running back Rob Martin flashed some explosiveness on a run up the middle. He also made a one-handed catch on a screen pass. Wide receiver Jawill Davis made a sliding catch in the end zone for a touchdown. Linebacker Connor Barwin continues to give second-string tackles Nick Becton and Chad Wheeler fits. Place kicker Aldrick Rosas was 3-of-4 on field goal attempts.